From the Department of Family Medicine, University of Colorado, Denver (LMD, WP, WPD, CE); the Adult and Child Center for Outcomes Research and Delivery Science (ACCORDS), University of Colorado, Denver (LMD, BB, AK); the American Academy of Family Physicians National Research Network, Leawood, KS (LMD, WP); the DARTNet Institute, Aurora, CO (CH, WP); Department of Family Medicine, the State University of New York, Buffalo (CF); the Department of Pediatrics, University of Colorado, Denver (AK); and the Children's Hospital Colorado, Aurora, CO (AK). Background: Cluster randomized trials (CRTs) are useful in practice-based research network translational research. However, simple or stratified randomization often yields study groups that differ on key baseline variables when the number of clusters is small. Unbalanced study arms constitute a potentially serious methodological problem for CRTs. Methods: Covariate constrained randomization with data on relevant variables before randomization was used to achieve balanced study arms in 2 pragmatic CRTs. In study 1, 16 counties in Colorado were randomized to practice-based or population-based reminder recall for vaccinating children ages 19 to 35 months. In study 2, 18 primary care practices were randomized to computer decision support plus practice facilitation versus computer decision support alone to improve care for patients with stage 3 and 4 chronic kidney disease. For each study, a set of optimal randomizations, which minimized differences of key variables between study arms, was identified from the set of all possible randomizations. Results: Differences between study arms were smaller in the optimal versus remaining randomizations. Even for the randomization in the optimal set with the largest difference between groups, study arms did not differ significantly on any variable for either study (P > .05). Conclusions: Covariate constrained randomization, which restricts the full randomization set to a subset in which differences between study arms are minimized, is a useful tool for achieving balanced study arms in CRTs. Because of the increasing recognition of the risk of imbalance in CRTs and implications for interpreting study findings, procedures of this type should be considered in designing practice-based or community-based trials. Cluster randomized trials (CRTs) are often the most feasible study design for pragmatic trials. Interventions that are designed to be at the level of a medical practice or community necessitate a unit of randomization other than the individual. Simple randomization, generally executed using a single sequence of random assignment via a random number generator or table, is expected to produce comparable study arms when the number of units to be randomized is sufficiently large (>30 per arm). When there are relatively few clusters with diverse settings and populations, however, simple randomization can result in study arms that differ substantially on key process and clinical variables or potential confounders, such as sociodemographic or contextual features.5⇓⇓⇓–9 Imbalance in a trial weakens the case for causal inference, the key strength of a randomized controlled trial, because observed differences between study arms following an intervention may not be attributable to the intervention, but rather may be the result of differences in the underlying study populations.5 In addition, imbalance can result in differences between crude and adjusted estimates of treatment effects, thus hindering the interpretability and face validity of the findings.5,10⇓–12 This problem has resulted in questions regarding the validity and/or generalizability of results from CRTs. Study 1 is a CRT of 2 reminder-recall (R/R) approaches (population vs practice-based) for increasing up-to-date immunization rates in 19- to 35-month-old children in 16 counties in Colorado, as part of the Agency for Health care Research and Quality–funded Center for Research in Implementation Science and Prevention (grant P01HS021138; A. Kempe, primary investigator). Identification of the patient cohort, practice affiliation, and outcomes were ascertained through the Colorado Immunization Information System (CIIS). All practices from study counties that delivered immunizations to 19- to 35-month-old children and were enrolled in CIIS were included.27 The unit of randomization for this study was the county. The population-based intervention used collaborations between primary care physicians, CIIS, and health department leaders to develop a centralized R/R notification (telephone and mail) for all parents whose 19- to 35-month-old children were not up to date on immunizations. In the practice-based arm, practices were invited to attend a webinar training on R/R using CIIS and were offered financial reimbursement for mailing or autodialer costs for R/R notifications. Study 2 is a National Institute of Diabetes, Digestive and Kidney Diseases–funded study (grant R01 DK090407, C. Fox, primary investigator) of computer decision support (CDS) plus practice facilitation versus CDS alone to improve care and outcomes for patients with stage 3 and 4 chronic kidney disease (CKD) in primary care practices recruited from the DARTNet Collaborative set of networks.28 In addition to the CDS tool that all practices received, practices in the facilitation arm received assistance with site coordination, physician champion's needs, audit and feedback, team approach to care, and education.28 Randomization of the 18 practices from the first wave is described here. Both studies are registered with clinicaltrials.gov (identifiers NCT01557621 and NCT01767883). To use covariate-constrained randomization, baseline data on clusters must be available. Investigators must identify a set of variables that (1) may be associated directly with the study outcome(s), or (2) may be potential confounders, or (3) could affect implementation of the intervention in practice or community settings. These can be measured directly at the cluster level (eg, rural location, practice size or type), or they may be derived from aggregated patient- or population-level data (eg, mean age, race/ethnicity, mean or percentage at goal on clinical measures). Once cluster-level data are obtained, the randomization process can begin. The first step for a 2-arm trial is to generate all possible randomizations of clusters into 2 study arms. For convenience we refer to them here as study groups 1 and 2. In the applications we describe here, the IML Procedure in SAS (SAS Institute Inc., Cary, NC) was used (see Online Appendix, step 1).23 Each cluster is assigned a numeric id (1, 2, 3, … n). If there are stratification variables, they can be incorporated into the procedure at this time (study 2), or investigators may choose to perform separate randomizations for different strata (study 1) and then combine them. Decisions about stratification requirements should be made in advance and usually involve requiring equal (or nearly equal) distributions of certain cluster characteristics in each study arm. This can be achieved by retaining only randomizations that have the required combination of clusters in each arm. For example, investigators might specify in advance that they want an equal number of rural practices in each study arm. Using the assigned cluster ID to create an indicator variable, the number of rural practices in each study group can be determined for each randomization, and those that do not have the specified number of rural practices (eg, 4 per study group) per arm are removed from the set of possible randomizations (see Online Appendix, step 2). To allow each measure to contribute approximately equally to the balancing process, cluster-level variables should be standardized (Online Appendix, step 3). Here we use a simple z score, where xi is the practice-level variable and s is the standard deviation across practices. The study 1 variables (cluster-level means, counts, percentages) that were converted to z scores are shown in the Online Appendix. The standardized cluster data set is replicated and merged with the randomization data set (Online Appendix, steps 4 and 5). The cluster ID is then used to determine which clusters are in study group 1 for each randomization generated by PROC IML; clusters that are not chosen for study group 1 are automatically assigned to study group 2 (Online Appendix, step 6). Standardized variables then are used to compute a balance criterion for each randomization, defined as the sum of squared differences between group means on all variables included in the balancing procedure (Online Appendix, steps 7 to 9). The balance criterion is actually a measure of the overall imbalance, or distance, between the allocated study groups; larger values indicate greater imbalance, whereas smaller values indicate greater balance. Weights (wi) can be applied to each variable, if desired. where z11 is the mean of group 1 units on standardized variable 1 and z21 is the mean of group 2 units on standardized variable 1, and so on. A cut point is established for the maximum allowable difference between study groups, based on the maximum allowable value for B, to define a set of “acceptable randomizations,” which we call the “optimal set,” in which the differences between study groups on covariates are minimized (Online Appendix, step 10). Although there is no set standard at this time, the criterion used here was to define approximately the best 10% as the optimal set (the 10th percentile of the distribution of B), thus minimizing the distance between designated study groups. Finally, a single randomization is randomly selected from the set of optimal randomizations to allocate clusters to study arms in the trial (Online Appendix, step 11). For study 1, county-level variables were used in the randomization procedure, and rural and urban counties were randomized separately. County-level data obtained from the US Census and the Colorado Immunization Information System are shown in Table 1. Variables were weighted equally (ie, wi = 1) and standardized (z scores) before computing the balance criterion. For study 2, practice-level variables determined from direct report or created by identifying potentially eligible patients with stage 3 or 4 CKD before baseline using electronic health record (EHR) data, and aggregated to the level of the practice to obtain practice-level means and rates, are shown in Table 2. Again, practice-level variables were weighted equally (wi = 1) and standardized (z scores) before computing the balance criterion. Practices were located in 3 geographic regions, and there were 8 practices that were members of 3 organizations. These were incorporated into the randomization as stratification variables. For both studies, the “acceptable set” was defined as approximately the best 10% of randomizations, based on the values of the balance criterion B. Randomizations with the lowest values for B were chosen for the optimal set. For each possible randomization, clusters were allocated to a treatment group (group 1 or group 2). Next, the absolute value of the difference between the allocated treatment groups on the original county- and practice-level raw variables was computed for each randomization (D = abs[x11 − x21]). These differences between the optimal set and the remaining randomizations were compared using Wilcoxon rank-sum tests to determine whether the procedure improved balance on the original variables. County-level data on the 16 rural and urban counties in Colorado shown in Table 1 indicate considerable heterogeneity. Within each stratum (rural, urban), SAS Proc IML generated 70 possible combinations of 8 counties into 2 study groups (This includes 70 urban and 70 rural, for a total of 140.). Next, county-level variables were standardized by computing z scores for each measure. For each randomization, the balance criterion was calculated as described above. The best 10% of randomizations (ie, lowest values for B) for rural and urban counties were designated as the optimal set. Figure 1 shows the distribution of the balance criterion across randomizations for the optimal set, the remaining randomizations, and the full randomization set (total area under the curve). From this figure, it can be seen that, although it is possible to obtain balanced study arms using simple or stratified randomization (ie, full randomization set), there is a considerable chance of obtaining highly imbalanced (large values for B) study arms. Essentially, covariate-constrained randomization increases the probability of obtaining a balanced randomization by limiting the possibilities to a subset with reasonable balance. Distribution of balance criterion in study 1. The full set of all possible randomizations is represented by the total area under the curve. The comparison of the optimal set with the remaining randomizations is shown in Table 1. The magnitude of differences between groups on the raw variables for the optimal set versus remaining randomizations indicate that the average distance between study groups, as well as the maximum difference between study groups, was generally smaller for the optimal set compared with the remaining randomizations (significantly smaller for the number of children ages 19 to 35 months, percentage up to date at baseline, and average income). Table 3 shows group means (standard deviations) on raw variables for the worst randomization (largest B) from the optimal set. There were no significant differences on any variable between study arms. Practice-level data for the 18 practices in the CKD study are shown in Table 2, again demonstrating considerable heterogeneity. This study included stratification variables in the procedure, rather than obtaining randomizations separately for each stratum and then combining. Initially, there were 48,620 possible combinations of 18 practices into 2 groups. Stratification variables included geographic location and practice organization. We determined the number of practices that were needed in each group for the 3 geographic locations and considered only randomizations with the correct allocation. A similar approach was taken for the 3 practice organizations. There were a total of 1728 randomizations that met stratification criteria. Next, practice-level variables were standardized (z scores). 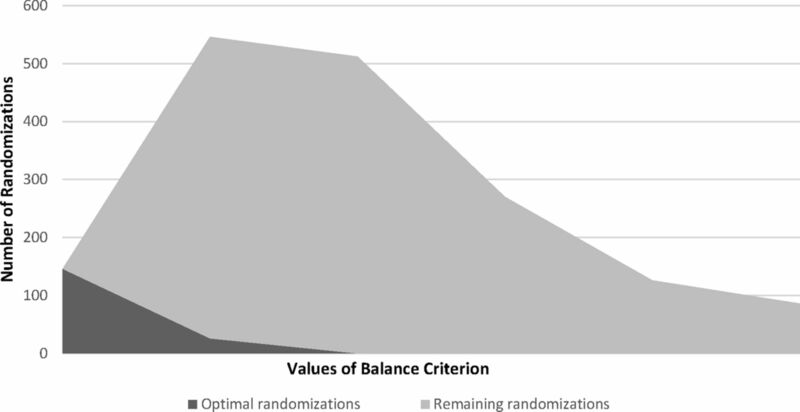 The balance criterion was computed for each randomization and, after examining the distribution of the balance criterion, the optimal set was defined as approximately the best 10%. Table 2 shows the average and maximum differences on each variable for optimal and remaining randomizations between study groups. Differences were significantly smaller in optimal randomizations compared with the remaining randomizations for most variables. Figure 2 shows the distribution of the balance criterion for the optimal and remaining sets. As before, comparison of the optimal set with the full randomization set (total area under the curve) shows that the probability of obtaining a well-balanced randomization is greater using the covariate-constrained randomization approach. Finally, study arms assigned using the worst randomization (largest B) in the optimal set were compared based on raw variables (Table 4). Again, there were no significant differences on any variable between study arms. Distribution of balance criterion. The set of all possible randomizations (after applying stratification criteria) is represented by the total area under the curve. Achieving balanced study arms should be an important priority when designing and implementing pragmatic CRTs. Stratification and matching, the most commonly used strategies, are often insufficient and result in nonequivalent study arms. Imbalance in study arms can compromise an investigator's ability to draw conclusions about intervention effectiveness because of underlying differences in the populations.1 In addition, interpretation of observed treatment effects is more difficult when study arms are unbalanced on baseline covariates because crude and adjusted estimates may differ considerably.1,6⇓–8 In this article we have described 2 applications of covariate-constrained randomization, a procedure for achieving balance across study arms in CRTs. Using covariate-constrained randomization, we identified a set of optimal randomizations from which the final study allocation was randomly selected. For the 2 studies described here, cluster-level data were obtained before randomization from a variety of sources, including EHRs, direct practice reporting, a state immunization registry, and US Census data. We demonstrated that differences on most cluster-level variables between study arms were significantly less for the optimal versus remaining randomizations. Perhaps more important, the chance of obtaining a well-balanced study arm allocation was much greater using this procedure. The 2 CRTs described here illustrate the variable selection process. In study 1, rural and urban differences were considered to be so extensive and multifaceted that the decision was made to randomize in separate strata. This was based on data demonstrating major differences in socioeconomic profiles, insurance coverage, provider specialties, the way health care is delivered in rural versus urban areas, and where immunizations are delivered (more likely to be in public settings or via public nursing entities in rural settings). Each of these issues could affect the potential for increasing immunization rates, independent of the specific intervention being studied. Investigators included the ratio of pediatric to family medicine practices because of known differences in the uptake of immunization delivery interventions by specialty. Racial/ethnic differences were important to include because of known differences in health-seeking behavior, access to care, and insurance coverage. Baseline up-to-date rates were important because of a known ceiling effect in the ability to increase immunization rates. Although not all variables of potential importance were available by county, the constellation of variables available was considered to adequately account for major sources of potential confounding. In study 2, numerous clinical variables were available from EHR data. Though inclusion criteria restricted the patient population to patients with stage 3 or 4 CKD, there was heterogeneity among practices regarding the extent of renal function decline, so average estimated glomerular filtration rates and percentage with stage 4 CKD were included. Since many patients had diabetes and hypertension, average HbA1c and systolic blood pressure (BP) were included. Data on some common quality indicators (ie, percentage with HbA1c >9, percentage with BP >140/90 mmHg, percentage with BP >130/80 mmHg) were thought to be important because of the potential impact on improvement in outcomes, and as indicators of practice success in quality improvement efforts. Practice characteristics such as organizational structure and the sociodemographics of populations served were also considered to be important because they may affect a practice's ability to implement interventions or achieve desired effectiveness. Applying methods for attaining balanced study arms enhances the ability to learn from pragmatic CRTs. Since pragmatic trials are conducted in real-world settings with patients with multiple and varied comorbidities, the results have real-world applicability; yet there are challenges in designing and executing CRTs that must be addressed. Covariate-constrained randomization is a feasible approach to achieving balanced study arms. While this procedure requires additional time and effort, it can help researchers get the most out of these expensive and time-consuming endeavors and help foster the production of high-quality, generalizable knowledge. Furthermore, minimizing differences between study arms generally has the effect of increasing variability within study arms. For larger trials, this may improve the researcher's ability to examine factors that affect intervention implementation as well as differential effectiveness.32 Further research is needed to determine optimal conditions for applying this procedure and to explore benefits and potential drawbacks. We recommend the use of covariate-constrained randomization approaches to improve balance in pragmatic CRTs when pre-randomization data on clusters are available and the number of clusters to be randomized is adequate. Because of widespread recognition of the risk of imbalance in CRTs and the difficulties this problem poses for interpreting study findings, procedures of this type are increasingly becoming a necessary state of the art in the design of practice-based or community-based trials. SAS code for the IML procedure (this can also be done using PROC PLAN). This code creates a data set that contains 9 variables (col1 to col9), each with values ranging from 1 to 18. These values are the practice ID numbers that are arbitrarily assigned to the 18 practices in this randomization set. The 9 selected for each randomization are group 1. The remaining practices ultimately are assigned to group 2. The example below uses only 4 variables (for brevity); original variables are replaced with their z scores. Remember that var1 through var4 are now z scores of the original variables. Funding: Funding for this work was provided by the Agency for Healthcare Research and Quality (grant no. P01HS021138) and the National Institute of Diabetes and Digestive and Kidney Diseases (grant no. R01 DK090407). Received for publication January 1, 2015. Revision received March 28, 2015. Accepted for publication April 13, 2015.
. Practice-based research networks (PBRNs) are promising laboratories for conducting dissemination and implementation research. J Am Board Fam Med 2014;27:759–62.
. National Institutes of Health approaches to dissemination and implementation science: current and future directions. Am J Public Health 2012;102:1274–81.
. A national strategy to develop pragmatic clinical trials infrastructure. Clin Transl Sci 2014;7:164–71.
. Practical clinical trials: increasing the value of clinical research for decision making in clinical and health policy. JAMA 2003;290:1624–32.
. Allocation techniques for balance at baseline in cluster randomized trials: a methodological review. Trials. 2012;13:120.
. Impact of CONSORT extension for cluster randomised trials on quality of reporting and study methodology: review of random sample of 300 trials, 2000–8. BMJ 2011;343:d5886.
. Internal and external validity of cluster randomized trials: systematic review of recent trials. BMJ 2008;336:876–80.
. Lessons for cluster randomized trials in the twenty-first century: a systematic review of trials in primary care. Clin Trials 2004;1:80–90.
. Design and analysis of cluster randomization trials in health research. New York, NY: Oxford University Press; 2000.
. Randomization by cluster and the problem of social class bias. J Epidemiol Community Health 1989;43:29–36.
. Effect of peer led programme for asthma education in adolescents: cluster randomized controlled trial. BMJ 2001;322:583–5.
. Effects of influenza vaccination of health-care workers on mortality of elderly people in long-term care: a randomized controlled trial. Lancet 2000;355:93–7.
. Improving care of patients at-risk for osteoporosis: a randomized controlled trial. J Gen Intern Med 2007;22:362–7.
. Evidence for risk of bias in cluster randomized trials: review of recent trials published in three general medical journals. BMJ 2003;327:785–9.
. Preventing dog bites in children: randomised controlled trial of an educational intervention. 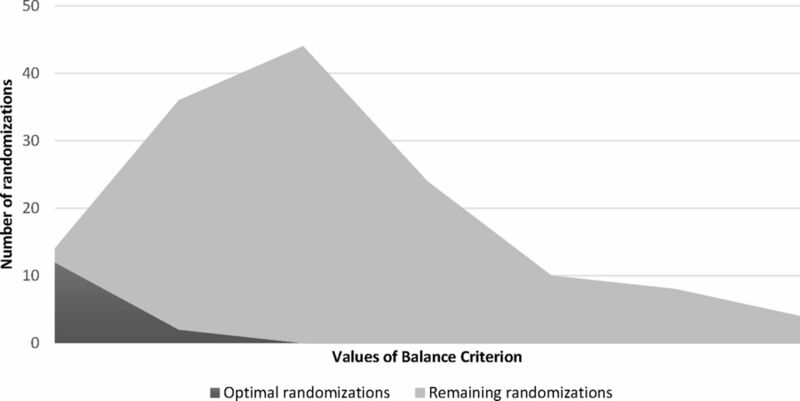 BMJ 2000;320:1512–3.
. Balance in cluster randomized trials. Stat Med 2001;20:351–65.
. Optimized probability sampling of study sites to improve generalizability in a multisite intervention trial. Prev Chronic Dis 2010;7:A10.
. Design of cluster-randomized trials of quality improvement interventions aimed at medical care providers. Med Care 2007;45(10 Suppl 2):S38–43.
. Covariate-based constrained randomization of group-randomized trials. Clin Trials 2004;1:297–305.
. A SAS macro for constrained randomization of group-randomized designs. Comput Methods Programs Biomed 2006;83:205–10.
. Balance algorithm for cluster randomized trials. BMC Med Res Methodol 2008;8:65.
. Adjusting clustering: minimize your suffering! Improving balance in baseline covariates in cluster randomized trials. Available from: http://support.sas.com/resources/papers/proceedings14/1570-2014.pdf. Accessed July 16, 2015.
. Studywise minimization: A treatment allocation method that improves balance among treatment groups and makes allocation unpredictable. J Clin Epidemiol 2010;62:1118–22.
. Comparison of dynamic block randomization and minimization in randomized trials: a simulation study. Clin Trials 2011;8:59–69.
. Preventing bias in cluster randomised trials. PLoS Med 2009;6:e1000065.
. Collaborative centralized reminder/recall to increase immunization rates for populations of young children: a comparative effectiveness trial. JAMA Pediatr. In press.
. Improving evidence-based primary care for chronic kidney disease: Study protocol for a cluster randomized control trial for translating evidence into practice (TRANSLATE CKD). Implement Sci 2013;8:88.
. Practice facilitation to improve diabetes care in primary care: a report from the EPIC randomized clinical trial. Ann Fam Med 2014;12:8–16.
. Practice context affects efforts to improve diabetes care for primary care patients: a pragmatic cluster randomized trial. J Gen Intern Med 2015;30:476–82.
. An application of a modified constrained randomization process to a practice-based cluster randomized trial to improve colorectal cancer screening. Contemp Clin Trials 2009;30:129–32.